著者名：JP Greving, FLJ Visseren, et al. 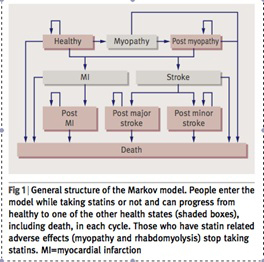 文献タイトル：Statin treatment for primary prevention of vascular disease: whom to treat? Cost-effectiveness analysis. To assess the cost-effectiveness of low dose statins for primary prevention of vascular disease, incorporating current prices, non-adherence (reduced clinical efficacy while maintaining healthcare costs), and the results of the recently published JUPITER trial. Cost-effectiveness analysis using a Markov model.（※1, and see fig1） Sensitivity analyses and Monte Carlo simulation evaluated the robustness of the results. 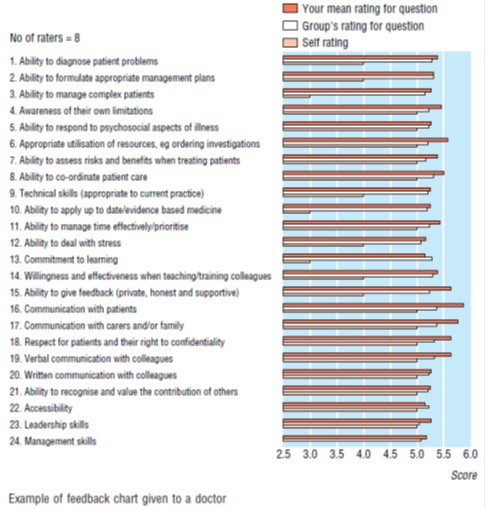 Primary care in The Netherlands. Hypothetical populations of men and women aged 45 to 75 years without a history of vascular disease at different levels of risk for vascular disease (myocardial infarction and stroke) over 10 years.? Low dose statin treatment daily versus no treatment for 10 years. 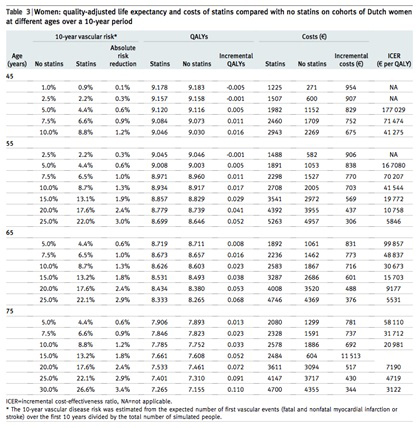 Number of fatal and nonfatal vascular events prevented, quality-adjusted life-years (QALYs), costs, and incremental cost-effectiveness ratios over 10 years. Over a 10-year period, statin treatment cost? ?35 000 (￡30 000, $49 000) per QALY gained for men aged 55 years with a 10-year vascular risk of 10%. 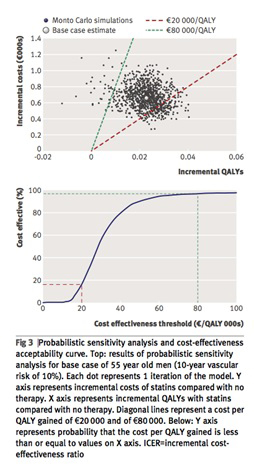 The incremental cost-effectiveness ratio improved as risk for vascular disease increased. The cost per QALY ranged from approximately ?5000 to ?125 000 when the 10-year vascular risk for men aged 55 years was varied from 25% to 5%. 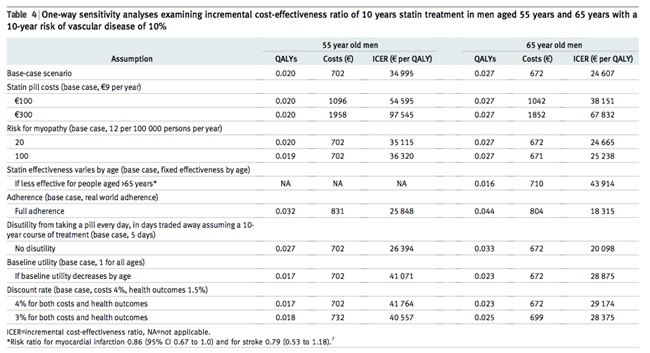 The incremental cost-effectiveness ratio slightly decreased with age after the level of vascular risk was specified (see table2 and 3). 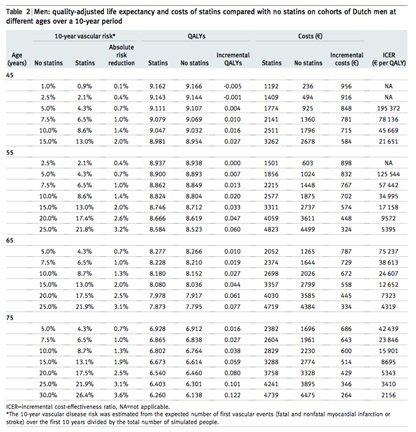 Results were sensitive to the costs of statin treatment, statin effectiveness, non-adherence, disutility of taking medication daily, and the time horizon of the model（see table4）.? In daily practice, statin treatment seemed not to be cost-effective for primary prevention in populations at low risk of vascular disease, despite low costs of generic drug pills. Adherence to statin treatment needs to be improved to enhance the cost-effectiveness of the use of statins for primary prevention. In Jpanese guideline, absolute risks for cardiovascular events are estimated from Japanese original cohort study, NIPPONDATA80. From this data, even if a man is in the highest risk group, the risk of cardiovascular events is 5-10% (low risk group in this article). The cost of statin in Japan is showed below. Should we change our daily practice? If we should, how?